1 Blemished Available: $349.99 This item is available as a Blem/Refurb. These are items that cannot be sold as "New" merchandise and are limited to stock on hand. See the product details for a description of the product's condition. 1 Blemished Available: $398.24 This item is available as a Blem/Refurb. These are items that cannot be sold as "New" merchandise and are limited to stock on hand. See the product details for a description of the product's condition. 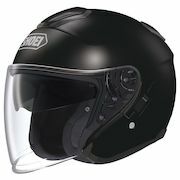 The Shoei J-Cruise is the Cadillac of open-face helmets. The classic ¾ design has been upgraded with features that make the J-Cruise a world class touring helmet. An internal drop-down sun visor, distortion-free Pinlock-ready face shield, adjustable ventilation system and 3D Max-Dry liner provide all day riding comfort. 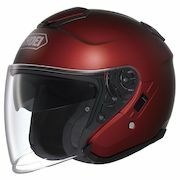 The face shield even has an integrated air dam that helps stabilize the helmet at speed and mitigate buffeting. If you like the freedom of a ¾ helmet, the Shoei J-Cruise is your ticket to ride.